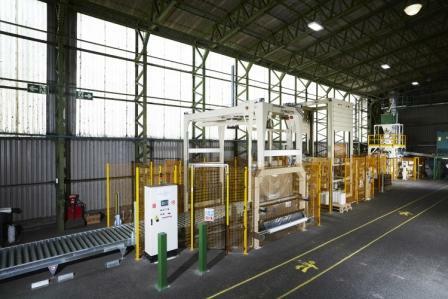 Concetti, Bastia Umbra (Perugia), Italy, has recently delivered a complete automatic bag filling, palletising and pallet wrapping line to the Lincolnshire, UK, plant of Germinal GB, a leading supplier of forage and amenity agricultural seeds. The new line is intended to produce weighments within the range 5 – 25kg into open mouth flat plastified bags of various sizes at a minimum rate of 500 bags/hour. Plastified bags consist of laminated paper with an internal PP coating. These are then closed by sewing. The line begins with a small product feed hopper and net weigher for precision dosing of the weighments. An agitator in the feed hopper ensures consistent product flow and a gravity feedgate with brushless-motor drive gives precise, programmable control over the gate aperture size for accurate feeding across the entire weight range handling a wide variety of bulk densities from 0.25 to 0.45kg/litre.